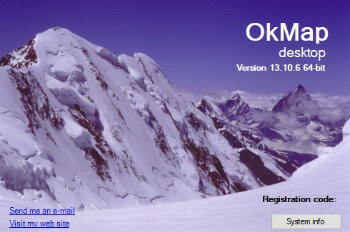 OkMap include a feature to generate automatically compatible Garmin Custom Maps (KMZ format) and maps in OruxMaps format. This feature includes map tiling from and to different image file formats (including ECW map format). It’s possible select KML extensions 2.2 (if GPS supports them), the JPEG quality, the image resizing, the KML transparency, the draw order, and so on. You can also select the tiles to generate in output. This feature support not north oriented maps also. – In the “Save GPX file” function, you can type the file name and the file description. – In the Preferences has beed added the value “Delta altitude” is used in the track recording to adjust the altitude values returned by the GPS. – After installing a new version, the indexing files and recent files are retrieved. – The functions “Import vectorial data from OpenStreetMap” and “Download waypoints from OpenStreetMap” have been enhanced. – Fixed a problem opening a GPX file with an extension in uppercase letters. – Updated “Swiss New Grid” projection.